Russian archeologists from the Center of Egyptological Studies of the Russian Academy of Sciences, with support of JSC Rosoboronexport, a unit of the Rostec State Corporation, made a unique discovery. 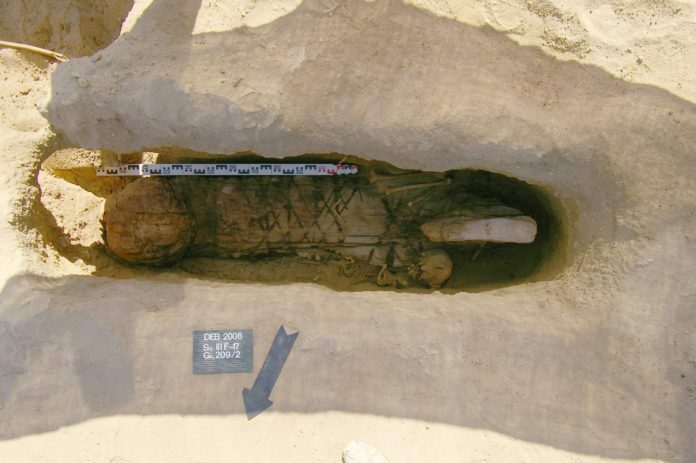 During excavation works on the site of an ancient necropolis in Egypt, they uncovered a burial chamber that dates back to a few thousand years. 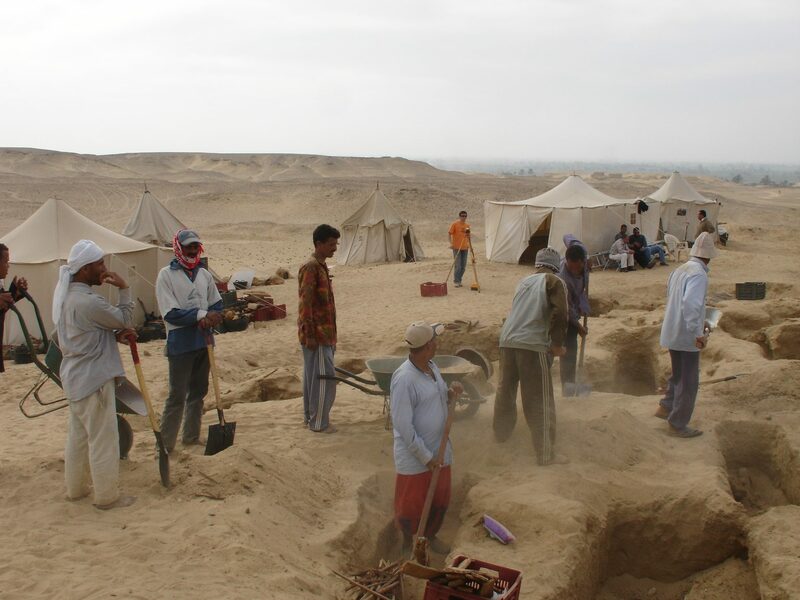 For over seven years, specialists have been excavating an ancient necropolis near Deir al-Banat, a Coptic monastery. The necropolis is situated in the Fayum oasis, on the shores of Lake Moeris (or Lake Qarun). In one grave well, the scientists uncovered a unique coffin that features elements of ancient Egyptian and Roman funeral rites. The mummy lay on a mattress and pillow, both richly decorated with tapestry insets. It was clad in several tunics and covered with a magnificently embroidered blanket. A few millennia later the body is in a good condition of preservation. The dead person’s head was placed in a very tall and narrow quadrangle, more than 0.5 meters high. The effect of a head towering high above the body was achieved by a special structure made from date palm stalks carefully wrapped in funeral tissues. The feet were wrapped in tissues in such a way that they formed a rectangle, small and neat. The ribbons arranged in a certain way imitated the pattern that ancient Egyptians had used to fix cartonnages on their mummies. As it turned out, the grave was holding the remains of a middle-aged well-off man. “Since 2003, the Center of Egyptological Studies of the Russian Academy of Sciences has been studying the vast necropolis spreading over the hills on the shores of Lake Moeris. During the studies, over 400 graves have been uncovered over an area of about 1,400 square meters. Their analysis is essential for the understanding of the lifestyles and culture of the people who had inhabited that oasis during the time period from the reign of the Ptolemaic dynasty to the early Middle Ages,” says Galina Belova, Head of the Scientific Division, Center of Egyptological Studies of the Russian Academy of Sciences. Further studies on the mummy will help specify the time of its burial. Presumably, it occurred during the Roman era in Egyptian history. Other mysteries of the mummy’s life and entombment could also be revealed. In the past, Egyptian archeologists started to explore the area. Their work is now continued by their Russian counterparts. The Russian archeological mission carries out excavations in several regions of Egypt: in Memphis, the country’s ancient capital, in Alexandria that lies along the coast of the Mediterranean Sea, and in the south — in Luxor suburbs. Rosoboronexport provides backing to Russian scientists. “Supporting culture and preservation of historical memory are important vectors of social activities for Rostec and Rosoboronexport. The archeological project is a significant element of Egypt’s cultural life and of Russia’s contribution to the study of the world’s heritage. It promotes a relationship of trust between our two countries, and positively influences partnership in various areas of Russian-Egyptian cooperation,” said Alexander Mikheev, Director General of Rosoboronexport. Every year, within the framework of the social policy of the Rostec State Corporation, the company sponsors multiple projects and events in culture, sports and education, both in Russia and abroad. “Rosoboronexport is a member of today’s business community, and development of that community is inconceivable without pursuing a social mission. The company adheres to the concept of social responsibility in its activities,” added Alexander Mikheev.